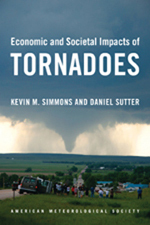 Its official release isn’t until next month, but the newest AMS book, Economic and Societal Impacts of Tornadoes, is debuting here in Seattle. The authors, Kevin Simmons and Daniel Sutter, are economists who gathered U.S. tornado casualty data from sources such as NOAA and the U.S. Census and used an economic approach to evaluate the National Weather Service’s efforts to reduce those casualties. The communication theme is a significant aspect of their analysis, and their book discloses some interesting findings on the efficacy of tornado warnings in the United States. 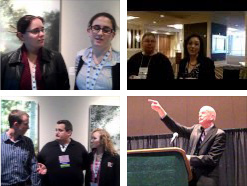 The authors sat down with us at the Meeting to discuss their book and research.